Restoring Day cream with SPF 15. Advanced regenerating action for radiant skin, full of life. Discover a highly regenerative skincare. Inspired by 20 years of research, Natecium® is an active ingredient of natural origin which helps protect the mother cells* to favour intense cellular regeneration. 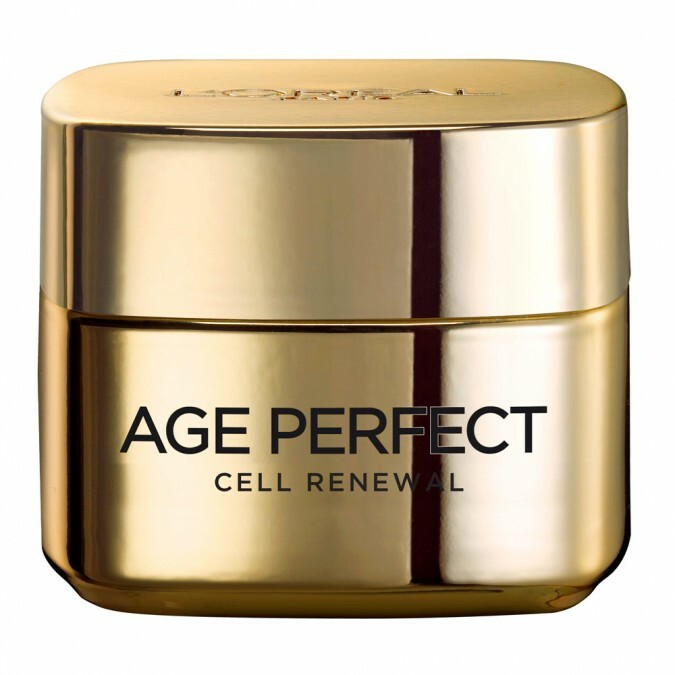 Age Perfect Cell Renewal helps accelerate the creation of new cells, day after day. Your skin gains vitality, tone and radiance for a healthy look. This highly regenerative cream also contains: - Pro-Calcium: a bio-compatible complex designed to strengthen the skin, day after day. - SPF 15: to help protect the skin against the harmful effects of UV rays. Texture: Luxuriously smooth and fine cream. Apply every morning on your freshly cleansed face and neck. Avoid contact with your eye area. AQUA / WATER, OCTOCRYLENE, GLYCERIN, ETHYLHEXYL SALICYLATE, ALCOHOL DENAT., HYDROGENATED POLYISOBUTENE, BIS-PEG-18 METHYL ETHERDIMETHYL SILANE, HOMOSALATE, BUTYL METHOXYDIBENZOYLMETHANE, DIMETHICONE, CETEARYL ALCOHOL, PEG-20, PETROLATUM, BUTYROSPERMUM PARKIIBUTTER / SHEA BUTTER, C13-14 ISOPARAFFIN, PEG-100 STEARATE, GLYCERYL STEARATE, DIMETHICONOL, DIMETHYL ISOSORBIDE, CETEARYLGLUCOSIDE, NEOHESPERIDIN DIHYDROCHALCONE, SODIUM COCOYL GLUTAMATE, SODIUM HYALURONATE, SODIUM HYDROXIDE, CYCLODEXTRIN, ADENOSINE, VIGNA ACONITIFOLIA / VIGNA ACONITIFOLIA SEED EXTRACT, MANNITOL, DISODIUM EDTA, DISODIUM SUCCINATE, HYDROLYZED CICER SEED EXTRACT, HYDROXYAPATITE, CAPRYLOYL SALICYLIC ACID, LAURETH-7, XANTHAN GUM, FAEX EXTRACT / YEAST EXTRACT, POLYACRYLAMIDE, ACRYLATES/C10-30ALKYL ACRYLATE CROSSPOLYMER, CETYL ALCOHOL, OCTYLDODECANOL, TOCOPHERYL ACETATE, SODIUM DEHYDROACETATE, PHENOXYETHANOL, CI 14700 /RED 4, CI 19140 / YELLOW 5, LINALOOL, GERANIOL, ALPHA-ISOMETHYL IONONE, LIMONENE, HYDROXYCITRONELLAL, CITRONELLOL, HEXYL CINNAMAL, BENZYL ALCOHOL, BENZYL SALICYLATE, PARFUM / FRAGRANCE. (F. I. L. B54859/3).